A complete set of photos for this trip can be found here. 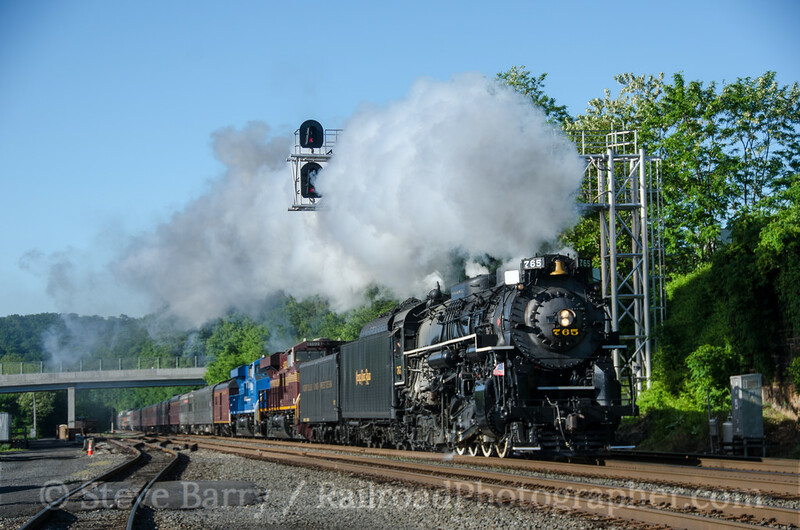 As we get the gallery caught up on the redesigned website, we're up to May 2013 and a trip that involved main line steam in the Northeast. 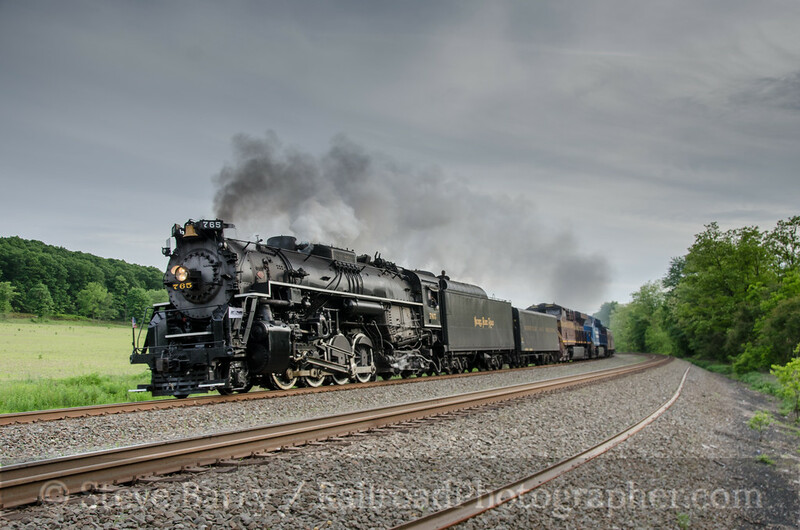 Norfolk Southern's 21st Century Steam program brought Nickel Plate Road 2-8-4 No. 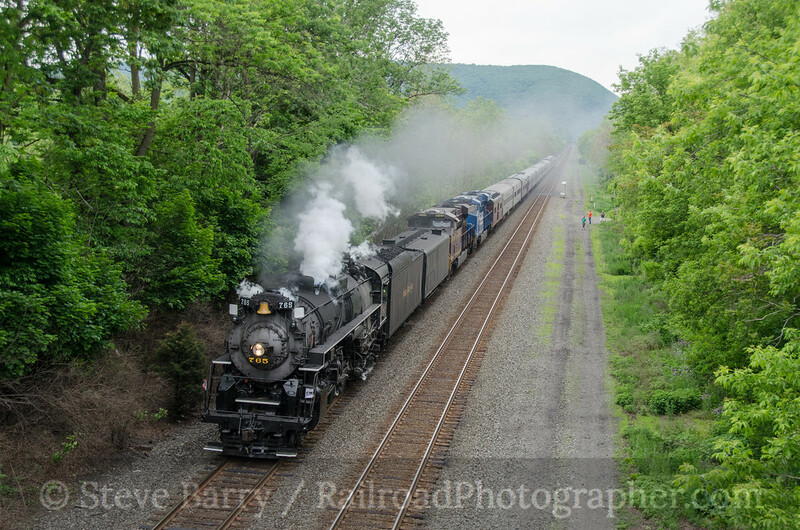 765 (leased from the Fort Wayne Railroad Historical Society) to NS's former Pennsylvania Railroad main line for a series of rips between Lewistown and Galitzin, Penn., over Memorial Day weekend. 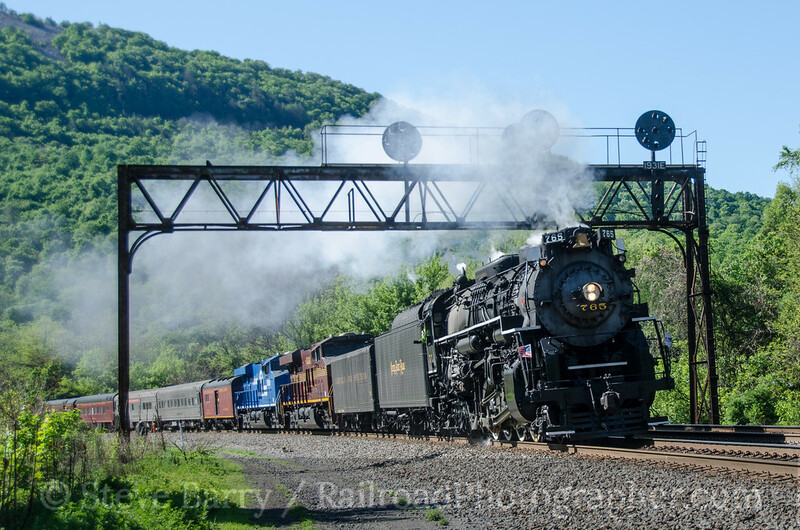 Due to operational logistics, the train would have to deadhead each evening from Lewistown to Enola Yard near Harrisburg for the night, then deadhead back to Lewistown in the morning. These moves were almost as long as the revenue trips. Since I had a commitment on Saturday of Memorial Day weekend (May 25), my first day to get out to the Harrisburg area was May 26. 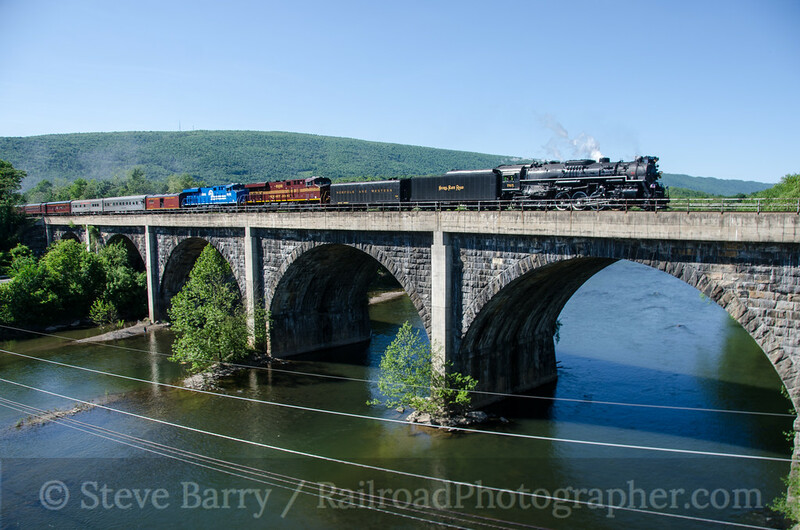 The train left the yard before the sun was over the mountains across the Susquehanna River, so I opted to head west to Mifflin where the tracks turn north, allowing for good sun angles on summer mornings. After a short parade of westbound freights, the 765 came blasting through on its way to Lewistown for the passenger pickup. 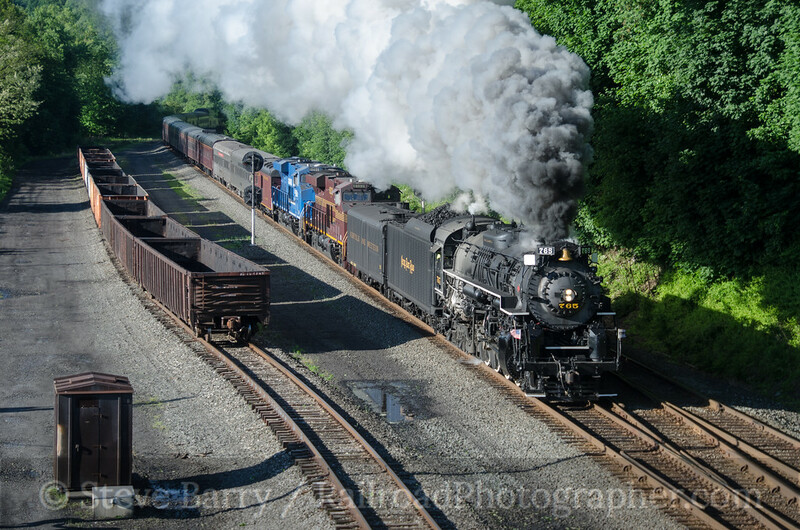 The previous day it had left before sunrise, but much to the consternation of NS the train got to Lewistown well before the advertised departure time of 8:30 a.m. and had to sit on the main line for quite a while, delaying freight traffic. On this morning they tried to make the deadhead's arrival time closer to the advertised revenue departure time. 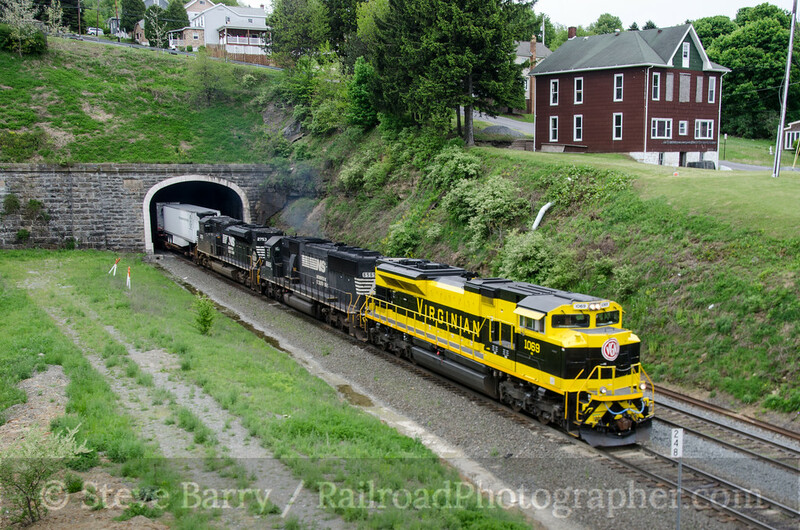 Using the lengthy stop to board passengers at Lewistown to get ahead of the train, I went off seeking the next shot. The story of the trip was the locomotive was running on the former Pennsylvania Railroad, and not many photo props say "Pennsy" quite as well as the classic position light signals that were unique to the railroad. A set was found between Mount Union and Huntingdon at Mapleton, and the train was duly recorded. From Huntingdon the tracks swing north through Tyrone while U.S. 22 makes a straight shot into Altoona. 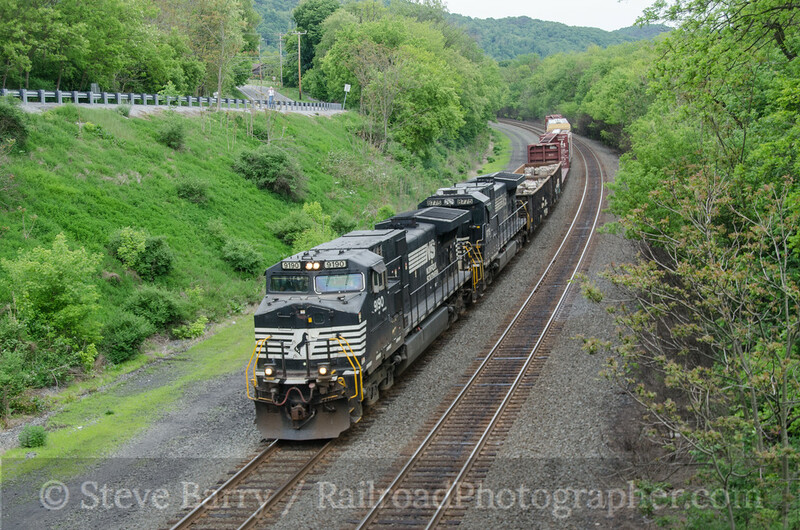 From Mapleton I headed directly to the signature shot of the trip, Horseshoe Curve. I knew it would take some hiking to get to the location here -- what I was not prepared for was the amount of other photographers here. Parking was a problem, resulting in a long walk, and then it was hard to find a location that wasn't occupied by someone else on the slick hillside overlooking the curve. I had no sooner found a place to wedge myself into than the whistle could be heard, a lot sooner than expected. Nonetheless, I got the shot (top of this post). The next shot I wanted was another classic Pennsy location -- passing recently closed Alto Tower in downtown Altoona. Once I had extracted myself from the hillside and made the long walk back to the car, I headed downtown and set up on the 17th Street bridge for the shot. 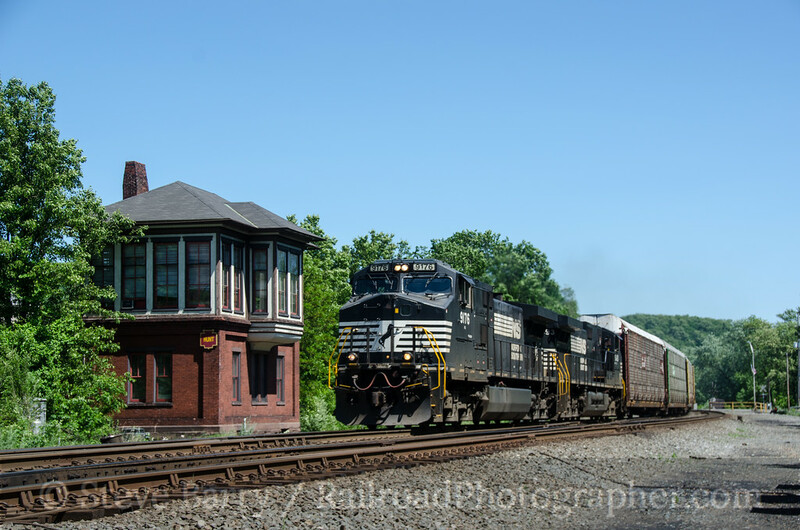 The train then paused in Altoona for a couple of hours so the locomotive could be serviced and passengers could tour the nearby Railroaders' Memorial Museum. My approach for the day had been to not get caught up in chasing the train with the hundreds of other folks doing the same thing -- instead, I'd pick a few shots that were many miles apart, let the crazies stay with the train and be in position well before the train (and motorcade of crazies) showed up. Thus, while the train was making its stop in Altoona, I leisurely got out of Dodge and headed for the next spot. Another shot on my wish list was just about 20 miles east -- crossing the Juniata River at Mount Union. The angle here was more broadside, and the tracks were oriented slightly more towards the south than at Huntingdon, so the uncooperative afternoon light wouldn't be a big issue. Amtrak's Pennsylvanian rolled through westbound to keep the large photo line entertained while we waited, and then 765 made its appearance crossing the Pennsy arch bridge. Light was getting tough everywhere for the eastbound chase. 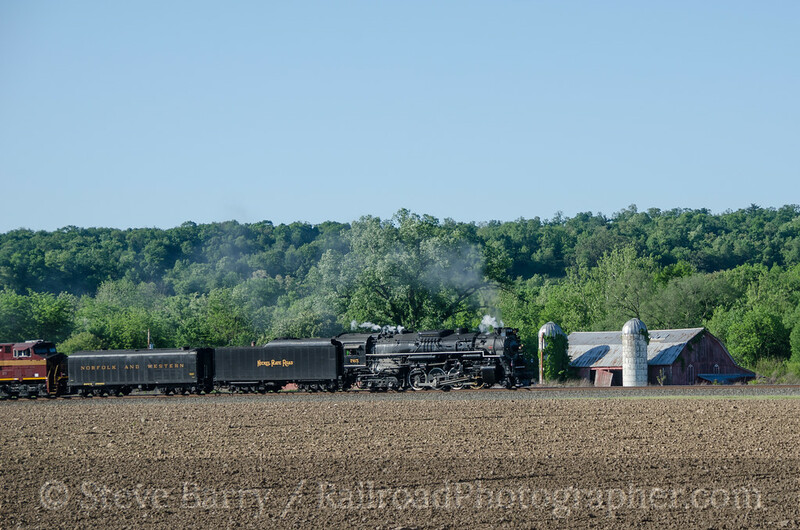 Using the passenger unloading stop at Lewistown to get ahead again, the best light that could be found was an across-the-field shot just east of Port Royal. Once again, broadside lighting saved the day, and an old barn added to the scene. The last shot of the day would be as the train turned mostly south for the final leg into Harrisburg. 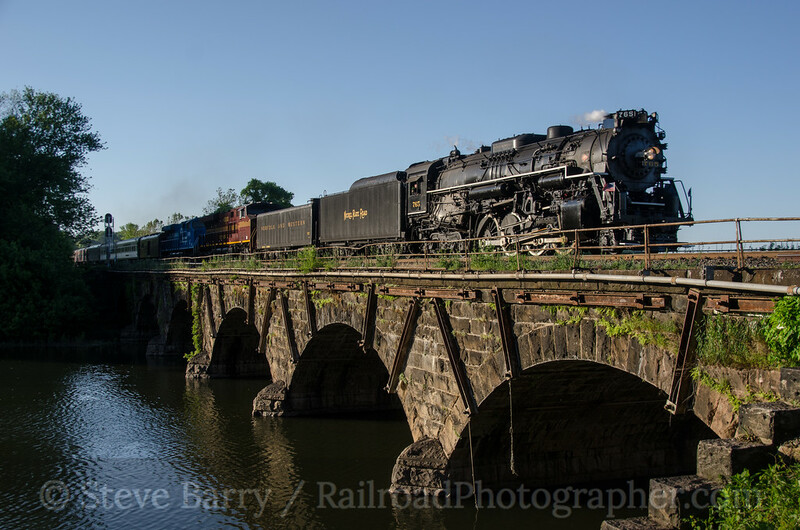 A large photo line was set up at Duncannon at the arch bridge as the train came across in the rapidly setting sun. It was a good way to finish up the first day of chasing. Photography-wise, the day wasn't quite over. It was back to Port Royal where a set of Pennsy position light signals still guard the main line. The concrete arch highway bridge made for a nice backdrop. While one might think a westbound shot would be preferable here, the westbound tracks are in a slight depression behind the eastbound tracks. Two going away shots of eastbounds turned out to be the best. In fact, the photo of the one westbound train that did show up isn't worth sharing, not even in the "complete" selection of photos on the website. The next day was going to be in some ways a little more ambitious, involving fewer shots however. 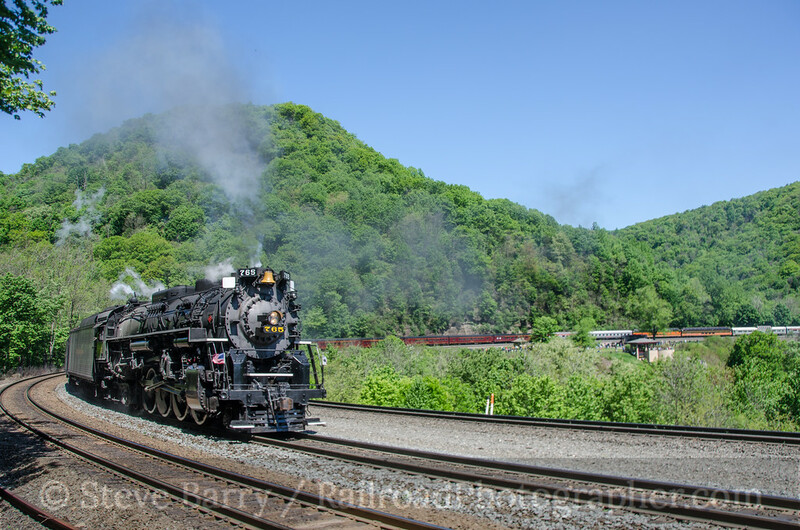 The day would include getting the big Berkshire passing an iconic Pennsylvania Railroad tower at a location known as MG, about a mile or so west of Horseshoe Curve. The problem with MG is that it involves a long hike -- about a mile and a half, uphill (but not uphill in both directions). After much deliberation, I decided that the best morning light would once again be at Mifflin, this time shooting from the highway bridge just east of where I had shot the previous morning. The cool air made for a nice white plume of condensed steam from the stack. To allow for enough time to do the 30-plus minute walk into MG I drove directly from Mifflin to the access path to the tower and walked in. the wait wasn't very long as the big steam locomotive soon came pounding up the hill. 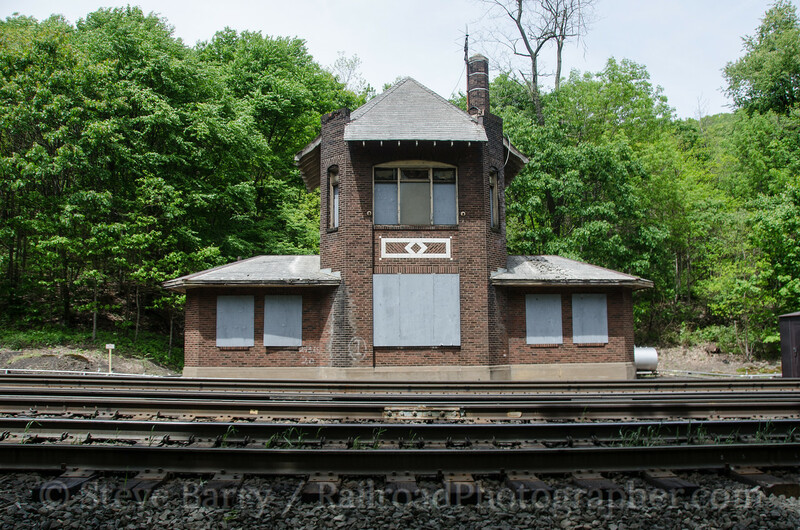 The train would proceed to the top of the grade at Gallitzin just to the west and turn on the loop rack there to come back downhill and continue east. While this was going on, there was time to check out the long-closed structure and get some photos. 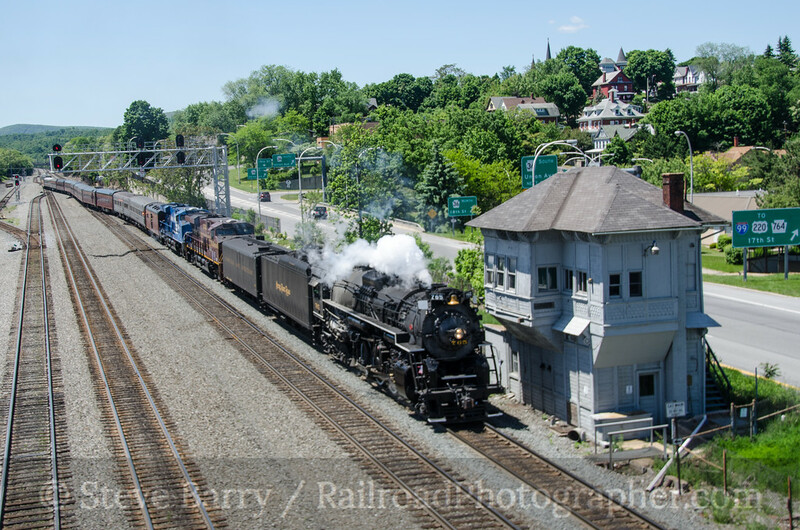 Following an eastbound freight, the steam special headed back down the hill for its layover in Altoona. However, many photographers did not follow the train back down into town. Word was out that a very special visitor was in the area. 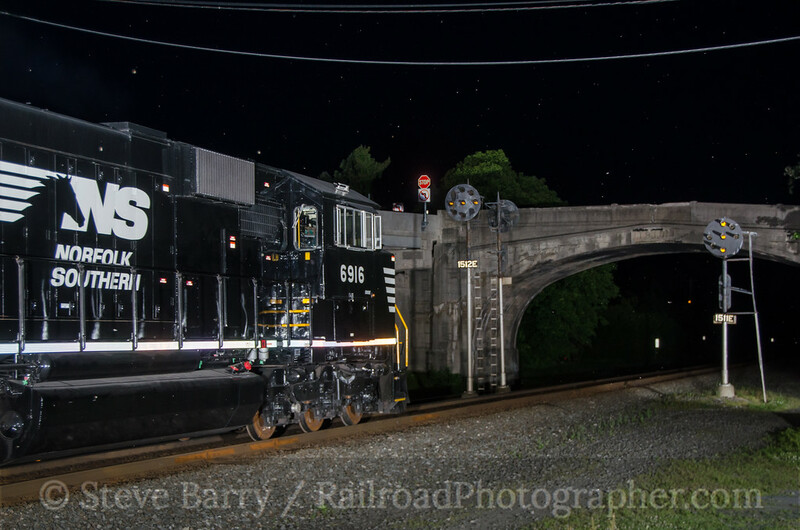 One of Norfolk Southern's colorful heritage units, this one honoring the Virginian Railway, was leading a westbound train. With clouds building up, I headed to the west end of the Alleghany Mountain tunnels near the summit of the grade at Gallitzin and waited. After getting the shot here, I chased the train into Cresson for another shot before returning back to look for 765 and its westbound move. By now the weather was universally blah, so I headed to Petersburg, the end of a long straight section of track. Delays in Altoona made the 765 late, but a nice parade of trains through Petersburg kept the crowds entertained. Most of the people gathered were non-railfans, and it was interesting hearing them yell "here it comes" every time a headlight appeared at the end of the straightway -- I could tell three miles away that it was yet another freight. The opposite direction from the straighaway presented a nice curve for photography. 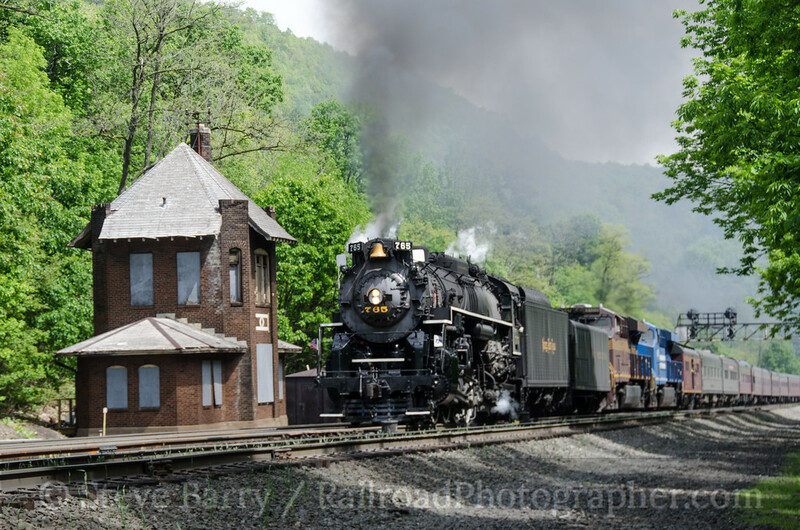 Finally smoke appeared at the end of the tangent (although most of the people gathered claimed it was yet another freight; the single headlight gave it away) and 765 came drifting through as it was heading down a slight grade towards the Juniata River at Huntingdon. Amtrak's Pennsylvanian was just out of Huntingdon, so I stuck around for that before making one last attempt to overtake 765. I followed the tracks and finally settled on a grade crossing outside Newport down a long dead-end road. 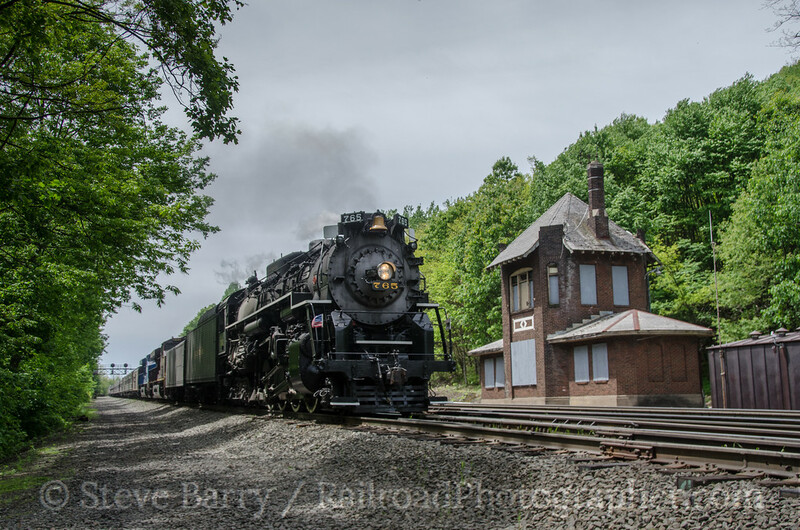 In the gathering darkness, 765 made on last impressive runby, wrapping up two great days of steam on the former Pennsylvania Railroad.